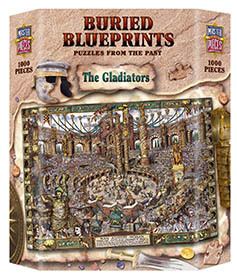 Buried Blueprints Jigsaw Puzzles were available from MasterPieces, but that company no longer lists the line on their website. Prior to MasterPieces, Buried Blueprints puzzles were manufactured by Bepuzzled. These were some of our favorite puzzles of all time, but we only made the puzzles manufactured by Bepuzzled, so cannot comment on the quality of the ones manufactured by MasterPieces. 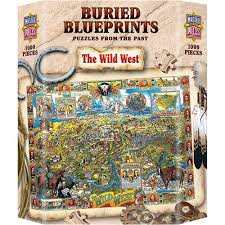 All Buried Blueprint jigsaw puzzles are 1,000 pieces, except the few Buried Blueprints for Kids puzzles, which were 165 pieces, and which we have not listed..